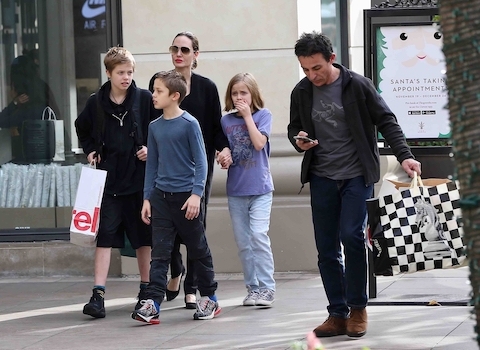 Sunday afternoon at The Grove – especially before Christmas – is usually a mob scene, so imagine how surprised shoppers were to see Angelina Jolie and three of her six kids bouncing from store to store together! Heads turned, but the Jolie-Pitts weren’t really bothered by fans. Usually JUST out of camera range is the watchful bodyguard – but he occasionally stepped up to retrieve and carry the family’s accumulated shopping bags. The “bodyguard” looks like one of her heroin buddies. Skinny and on the phone. Real nice. so these kids had a horrible weekend for sure…………..
A good mom would be guarding her childrens’ privacy, not dragging them out for a photo op. Don’t see their father parading them around in public. Sorry for these kids. Looks like they are being used by their mom, AGAIN. I won’t fund her efforts by watching any of her movies. Angie seems to now be hiding her major lesbian side…….PAGING Jenny Shimizu! Gee, this looks so natural not staged at all. Those poor kids.